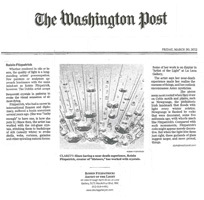 To download the full press release, please click here. 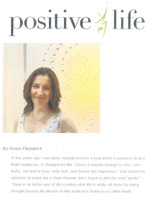 "Roisin's art is inspiring and uplifting, particularly during these challenging times. Hence she shares her art as Artist of the Light." "Each artwork using themes from nature, Celtic symbols and the cosmos, mesmerizes the observer, revealing a sense of deep inner peace, harmony and soul connection." "The art brings beauty and nature together by expressing intricate patterns with simple elegance." 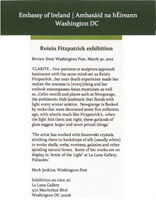 "CLARITY... Few painters or sculptors approach luminance with the same mind-set as Roisin Fitzpatrick...her near death experience made her realize the oneness in [every]thing and her outlook encompasses Asian mysticism as well as...Celtic motifs and places such as Newgrange, the prehistoric Irish landmark that floods with light every winter solstice. Newgrange is flanked by rocks that were decorated some five millennia ago, with whorls much like Fitzpatrick's...when the light hits them just right, these garlands of glass suggest larger and more primal things." 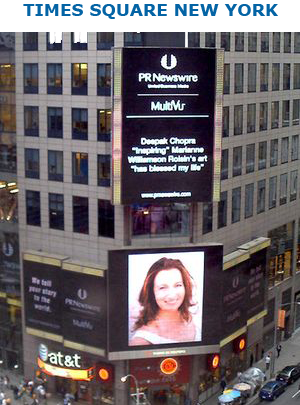 "Illuminating New York...a contemporary interpretation of light infused phenonema.' 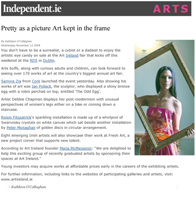 Irish Arts Review, Autumn 2011"
"Her highly individual work has been widely acclaimed. 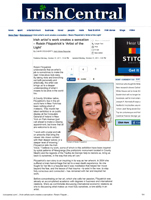 She illustrates the interconnectedness of light from the dawn of time to the present day, ranging from pre-historic art to nature, to the stars in astronomy to the celtic mythology...all with a uniquely personal and contemporary aspect.' 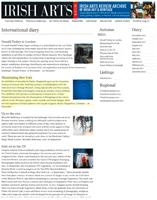 Irish Arts Review, Spring 2012"
"Our team LOVED Roisin Fitzpatrick’s Artist of the Light exhibition. It is a must see." "Fitzpatrick’s rise in the art world in New York has been nothing short of meteoric… She creates art that subtly mesmerises the observer. 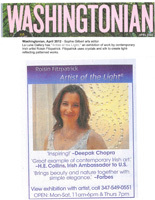 Contemplating her intricate and elegant patterns produces a light trance state in the viewer which brings you closer to her intention with each work… The magic and light in Fitzpatrick's recent artistic work arises directly from her near death experience." 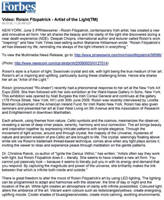 "Irish Artist of the Light shines in New York...Fitzpatrick works with crystals which beautifully reflect and refract ligtt...A glance at her list of fans and supporters speaks to her wide appeal and profound affect." 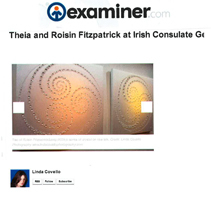 "Roisin Fitzpatrick, contemporary Irish artist, has created a new and innovative art from. Her art shares the beauty and clarity of the light she discovered during a near death experience." 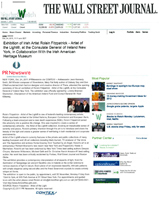 "Fitzpatrick has quickly established herself with exhibitions of her work on both sides of the Atlantic…. Fitzpatrick's style is a fusion of light, crystal and silk, which aims to recreate the sense of deep inner peace." 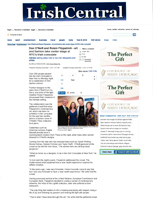 Peter McDermott, Assistant Editor Irish Echo, New York. 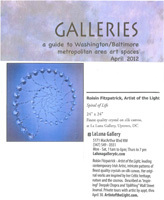 "Light is the essential element of her art. Roisin skilfully combines light with crystal and silk to create her unique style of art… Take my advice and make an appointment to see it as it will blow your mind as to how good she is." 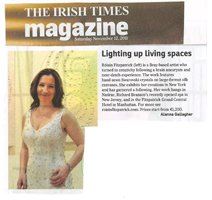 "Roisin Fitzpatrick Artist of the Light is one of Ireland’s leading contemporary artists"
"Lighting up living spaces...Roisin Fitzpatrick exhibits her creations in New York and has garnered a following." "You don't have to be a surrealist, a cubist or a dadaist to enjoy…Roisin Fitzpatrick's sparkling installation… made up of Swarvoski crystals on white silk…"
"Exhibition provides a contemporary interpretation of all aspects of light using natural silks and fine crystals to create entirely unique art forms." 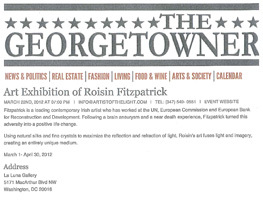 "An exhibition of work by contemporary Irish artist Roisin Fitzpatrick. Fitzpatrick uses crystals and silk to create light-reflecting patterned works." "Using natural silks and fine crystals to maximize the reflection and refraction of light, Roisin's art fuses light and imagery, creating an entirely unique medium." "Roisin Fitzpatrick – Artist of the Light, leading contemporary Irish Artist, intricate patterns of finest quality crystals on silk canvas. 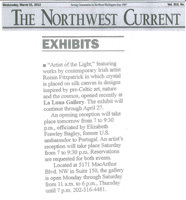 Her original works are inspired by her Celtic heritage, nature and the cosmos." "Roisin Fitzpatrick – Artist of the Light, who previously worked at the U.N., was inspired to take up art after a brain aneurysm. 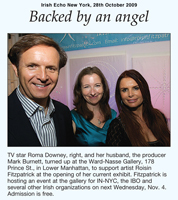 Now a leading contemporary Irish artist, Fitzpatrick uses the finest quality crystals and silks to maximize the reflection and refraction of light in original works that are inspired by her Celtic heritage, nature and the cosmos." "Evoking an inexplicable sense of serenity and peace, Roisin's primary intention through this art is to introduce and share the beauty of the light." 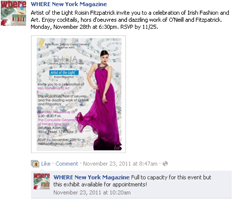 "Roisin radiates a passion and enthusiasm for her sharing her art. Her art is transcendental and meditative and assists people to connect with their own inner light"
"Go, experience and "See the Light!" Roisin Fitzpatrick, contemporary Irish artist, has created a new and innovative art form. 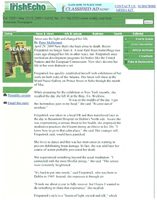 Her art recreates and shares the beauty she discovered during a near death experience"
Critical acclaim was also received from Artslant, NY Artbeat, Irish Independent, AOL Money and Finance, Sacramento Bee, Dallas News, Philadelphia Buiness Journal, Orlando Buiness Journal and Albany Business Journal.